We’re in the truck, driving to Wilmington, New York. I’d love to share a quick free-verse I wrote about a sunset I saw while we were driving through Pennsylvania (before Pennsylvania becomes too far away). There were dark rain clouds contrasting with a glowing sunset. I took a little poetic license to increase the drama. The world lay sleeping beneath a leaden blanket of indigo; brilliant flames of orange licked out from beneath the safe softness of the clouds and lapped with long fingers at the heavy silence as if willing the world to wake again. 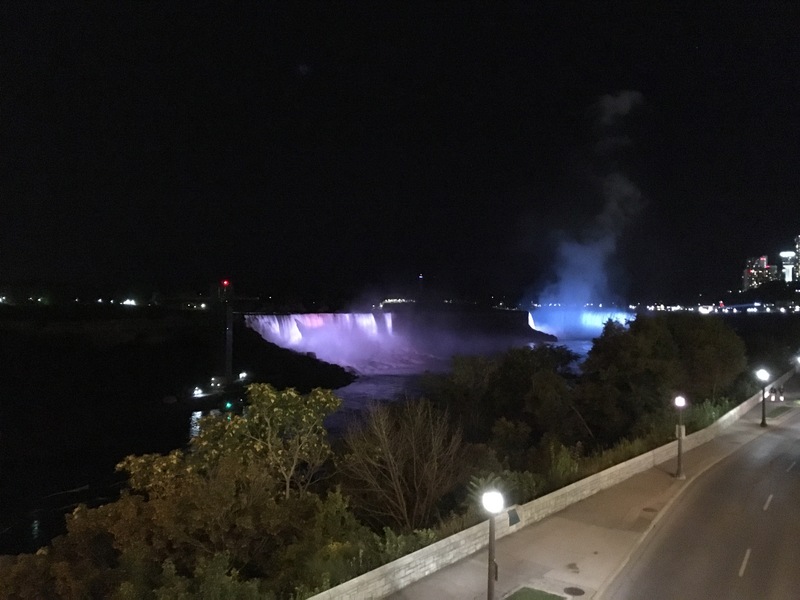 We walked over to Canada to see Niagara Falls last night. (Doesn’t that sound impressive? We went over a bridge to get there.) In the darkness, the falls were illuminated with huge LEDs that made them change colors. The water roared steadily and the mist was like smoke. The crowds, the night, and the different country all served to make the experience quite exciting! Have you ever seen Niagara Falls? We have! But not from the Canadian side, unfortunately.